Would you like a proven formula that will put your group on the path to achieving your highest potential and making a bigger impact? 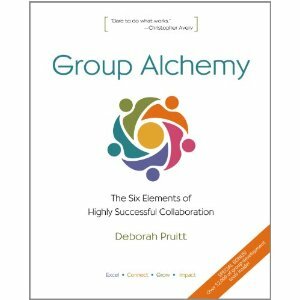 Our book: Group Alchemy: The Six Elements of Highly Successful Collaboration will get you there. One of the most enduring challenges facing us all is how to get groups to work together in a way that is maximally productive and life enhancing. This book solves that problem with a ground breaking, comprehensive system called the Formula for Group Alchemy®. This formula takes you step by step through the six elements (inspiration, agreements, accountability, acknowledgment, renewal, mastery) groups use to capture their full potential. By developing positive habits in each of these elements you can be confident you will not be squandering the genius in your group but instead will be combining your diverse talents intentionally to create a positive group culture of collaboration. Your group will establish clear unity of purpose, devise ways to stay inspired, and work from a sense of what is possible. This alone can eliminate the typical group struggles of defensiveness, competition, low accountability, personality conflicts and poor communication. You’ll develop responsibility and ownership across your group and establish strong agreements that support everyone in doing what works. Then you can create powerful accountability by removing the sting of blame and restoring accountability to its proper place in organizational learning and accomplishment. You will know how to continuously expand your group’s capacity to produce better results when you develop critical habits for identifying what isn’t working, make adjustments where needed, and make it a habit to celebrate and nourish your successes. As you develop mastery in group alchemy you learn how to reach deeply into its diverse talents and perspectives and harness their full creative potential and sustain that by fully acknowledging each others’ contributions. These are the habits that routinely generate the communication and trust necessary for truly successful collaboration—the kind where people invest heavily in the group’s goals and aspirations and are willing to do what it takes to reach them. This results in your own creative alchemy and distinctive group culture that transcends any particular individuals and does not depend upon the personalities in the group. If you fully engage your group in this system, you will ensure that it becomes capable of high-level performance and achieves ever-higher levels of effectiveness over time—as a matter of course, whatever comes your way. Often when we work with stellar consultants, we wish they’d give us a how to manual. This is the book I wish I had when I was setting up a new organization. new book of the year. The Group Alchemist monthly newsletter packed with practical tips. A free telephone strategy session with Deborah. Group Alchemy is an inspiring call to action for all of us to participate actively and wisely in the organizations thru which we live our lives.